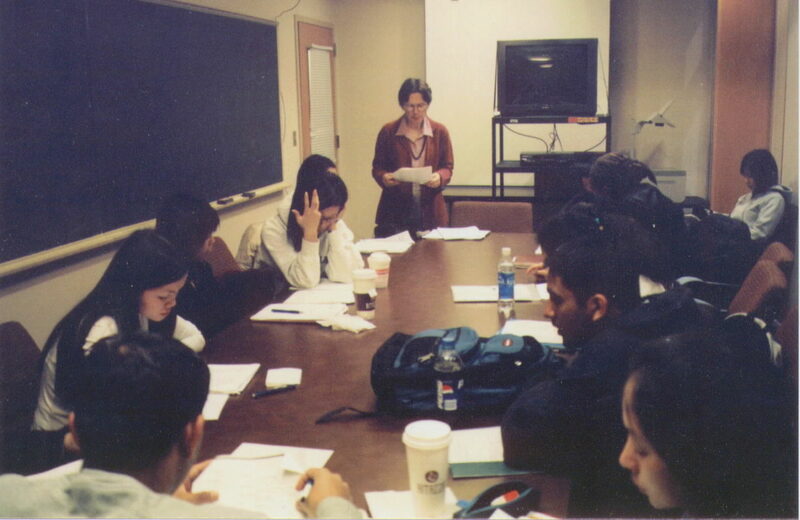 Christine Parkhurst teaches ESL at the prestigious Massachusetts College of Pharmacy and Health Sciences. Their brochure reads: "MCPHS is progressive, supportive, and highly focused...We work together and support each other's efforts. This is important, given MCPH'S emphasis on active learning." And, a student (Natalie Gamburd), says: "The teachers...give us the building blocks, and expect us to put them together. A lot of the exam questions require critical thinking -- you have to apply your knowledge, not just recite the information back." The key terms mentioned above are: "progressive," "active," and "critical thinking." Into this environment and to support these approaches, drama becomes a necessary tool. 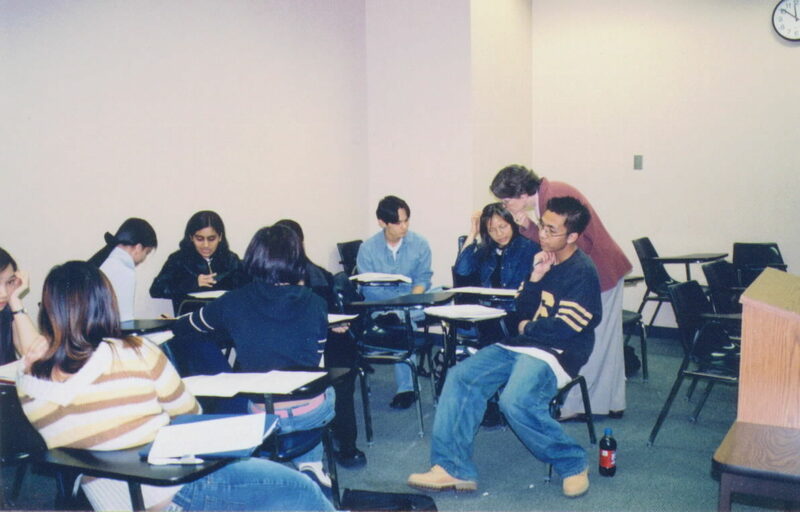 Chris Parkhurst's class then, can be seen also as a good example of ESP, or English for Special Purposes, for she must blend everyday use of English with very specific medical, pharmaceutical, and chemical language. Her job is a crucial one. These young student/pharmacists must not only be able to communicate with doctors, but also to deal with the clients they serve in humane and knowledgeable ways. A misunderstanding in this context might produce catastrophic results. The stakes are high and the need is for extremely precise and articulate language. Drama plays its role. Below, is how Christine Parkhurst uses it. The component of drama that Christine Parkhurst must use most is role-play. In order to simulate intereactions between the three major players in the communicative process for pharmacists, roles are divided (and alternately practiced) that include a nurse at a doctor's office or the doctor him/herself, a pharmacist, and a patient. To support the conversation, students must know names of medicines, medical vocabulary in general, and understand descriptions of symptoms. Christine goes over these terms and expressions at the beginning of each class. After the students are warmed up with the replay of appropriate vocabulary words, they are given the following assignment. Practice the following exercise with a partner. One person will be the patient and call the pharmacist to explain a problem or question. Explain what your problem is. If you are a pharmacist, make sure you understand by saying, "Let me make sure I understand your problem." Then summarize what the person just told you. Look at the list below for possible problems. When you come to work at the pharmacy, you find a note asking you to call to clarify the following problems. Call the doctor's office and clarify the following problems. Then ask what the doctor would like to do, or what you should do; make a suggestion about what to do if the doctor asks for your opinion. Prescription for Emetrol antiemetic for patient Wanda Landowska: dosage form -- liquid or suppository? Prescription for patient Arthur Rubenstein: Desogen or Desogestrel? Can't read handwriting. Prescrition for patient Matthew Schuster: how many refills? Prescription for Thyroxine for patient Alfred Brendal: medication doesn't come in requested strength of 100 mg, only 10 mg and 25 mg. Prescription for penicillin for patient Ellen Sotkowitz (age 10): adult dose (50 mg) given for patient -- intentional? Prescription for Amoxcillin for patient Patricia Chivers: Medication interacts adversely with MAO inhibitor patient takes; change type? Prescription for Amoxicillin for patient LaKaysha Harley: Patient shows no improvement after taking antibiotic for 48 hrs. -- she phoned to say her earache is worse. Prescription for Augmentin for patient Tony Kopecki: Patient is allergic to antibiotic (phoned to report rash, but no difficulty breathing). Prescription for patient Lifong Li: Patient has taken generic fexofenadine, says it didn't work for her, wants brand name Allegra-D. Prescription for Harriet McClain: Patient can't afford brand name drug Evista, wants generic instead. 1) Identify yourself: This is (your full name) calling from (your pharmacy). 2) Request: Is Dr. (name) available? OR May I speak to Dr. (name)? you wrote for (patient's name). -dosage form -- ointment or cream? -Adult dose given for pediatric patient--intentional? -Patient is allergic to medication (rash, difficulty breathing). 4) Ask what the doctor would like to do, or what you should do; make a suggestion about what to do if the doctor asks for your opinion. One can immedeately see that these scenarios call for not only linguistic skill, but pronunciation precision and, indeed, critical thinking and problem solving. (The students have been given medical tapes that they work with at home that focus on consonants, vowels, and vocabulary). Where there is a communcative or grammar breakdown, Christine intervenes and models. The grammar is corrected as they rehearse. They practice clarity and comprehension of the exchange. As I listen to the improvised exchanges, I hear high level vocabulary practiced. Words associated with symptoms, "rash," "allergic reaction," "swelling," "vomiting," "nose bleeds;" words associated with medicines, "Benadryl," Tetracyclin," "Tylenol," "Demoxirol," and names of diseases such as AIDS, pneumonia, gout. The students not only need to know the pronunciation of such terms, but also need to know the medical outcomes of the use of the medicines involved. These role-plays show what they know and what they need to know. 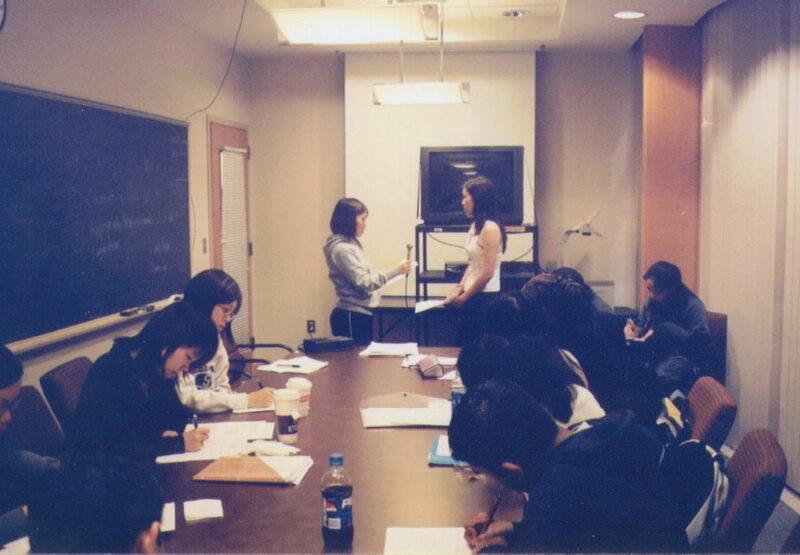 After the rehearsal session, each pair is given an opportunity to role-play before the class while the class members take notes. As they role-play, they use microphones and are recorded so that they can judge for themselves how effective communicators they are when the tapes are played back. They can also correct any pronunciation problems involving names of medicines or diseases. Another type of role-play that Chris has her students do involves a pharmacist and patient. This practice comes under the rubric of pharmacist/client counseling and involves the pharmacist advising the patient about options that are appropriate to a patient's problem. The following scenarios are used. 1) Patient: Matthew Feiteg Medication: Clinoril tablet 150 mg. Patient: this upsets your stomach so you will only take it when your arthritis pain is really bad; otherwise you take aspirin instead. 2) Patient: Marian Michealson Medication: colchicine gout remedy tablet 50 mg. Patient: When you have a gout attack, you take one but it doesn't usually work, so after a few hours you take another; sometimes the pain is so bad you vomit. 3) Patient: Lee Murphey Medication: Combit capsule 15 mg. Patient: The doctor told you to avoid hot weather exercise but you're a marathon runner so you just try to run early in the morning in the summer. 4) Patient: Eve Fairchild Medication Dalmane capsule 30 mg. Patient: You find this works really well when you hav a little wine with dinner. 5) Patient: Raj Chopra Medication: Elixophyllin elixir 80 mg. per 15 ml. Patient: You find this makes you really drosy if you have a little wine with dinner, and it also upsets your stomach sometimes. 6) Patient: Ginette Kirsch Medication: Pronestyl capsule 500 mg. Patient: When you had a cold you stopped taking this so you could take cold medicine and you found that your heart pounded more than ever. With these scenarios to work from, the language level ranges between the mundane to the technical as the patient describes the problems s/he is encountering and the pharmacist advises on the use of the medicine. The students playing the pharmacists have a list of medicines on hand and also a sheet that discusses the dangers or side effects of the medicines noting medicines whose interactions would be adverse. The students follow the pharmaceutical protocol, making sure that the patient is the right person, what their background is, and ask about "new diseases or ailments diagnosed since the last visit." If a question arises that can't be answered by the pharmacist, s/he must make a call to the doctor to get the issue clarified and for resolution of the problem. All the time that these conversations are occurring, Chris watches and listens. When she hears a student say, "not addivitive," she changes it to, "not addictive." "StoMACH" becomes "STOmach" and so forth. At the same time, a tape recorder is used for each student exchange so that corrections can be remembered later. In short, the students must know the answers to the problems raised and be able to articulate their answers through clear speech. For their final exams, the students are expected to know the top 400 generic and brand name drugs, to be able to read, spell, and stress each drug name appropriately, and know how to counsel patients in the use of each. When there is a problem, they need to know what to do and say. All final exams are impromptu role-plays, the students working from detailed patient profiles such as the following. Patient profile indicates that Claude belonged to an HMO but no longer has coverage because he lost his job. He has been working a combination of minimum-wage jobs which offer no benefits. He has TB and has almost completed the course of medications, which he's paid for out of pocket, but he says that the cost is draining his savings. Because he's a legal immigrant, he's worried about applying for any programs which might help cover the costs of the medication. He doesn't know if he can afford to complete the regimen, and anyway, he's feeling better. You get the picture. "Progressive," "active," and engaging the use of "critical-thinking." These role-plays integrate these key terms and support the Massachusetts College of Pharmacy's mission. 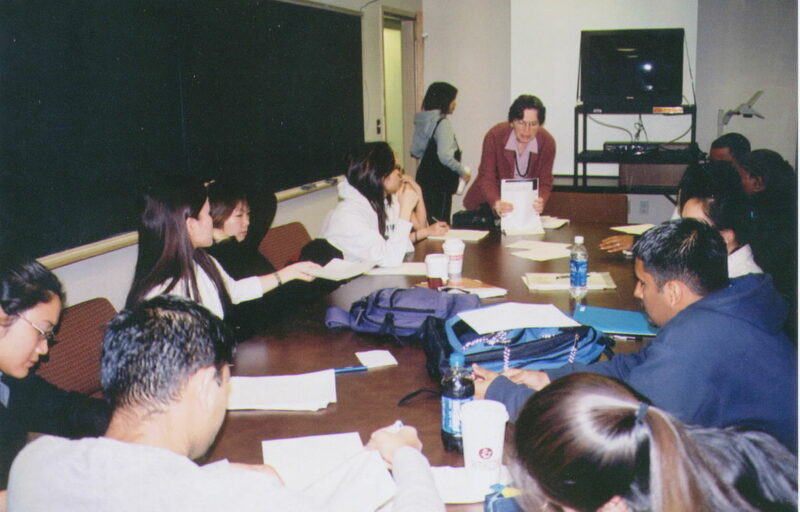 Students leave MCPHS using all their faculties because they have learned by using them all through drama. The kinesthetic, the cognitive, the emotional, and the social domains are each involved to produce students whose knowledge is dependable and whose communication of it is clear. Christine Parkhurst says that "the aim is to have the students take on a new identity: that of a professional pharmacist." By acting out their new role as they learn, they become what they imagine. Many thanks to Christine Parkhurst and the Massachusetts College of Pharmacy and Health Sciences for their cooperation with this project.